This oil painting, by one of my favorite artist Wayne Thiebaud, was painted in 1978. Of course Wayne is known for his pop subject such as cakes, lollipops, and gumball machines but I think his San Francisco streetscapes are equally interesting. I like this particular painting because I find this picture is really more about study of shapes and how they interact and overlap with each other. It's this juxtaposition of balancing different colors and composition that interests me more than the actual painting of roads, houses, and trees. His SF streetscape paintings are always a bit disorienting because of the colors, composition, and perspective he uses which I find fascinating. Thiebaud actually started off as an artist for Disney. After studying at various universities around SF bay area, he ended up in NYC and befriended with abstract expressionists such as Williem de Kooning and Franz Kline and influenced by Neo-dadaist. Upon returning to SF Bay area, he continued to paint using pop subjects but now with thick impasto, gestural brushstrokes, and metallic paints. 1962 Sydney Janis Gallery, a blue chip gallery in NYC, officially launched Pop Art, bringing him national recognition and rest is history. 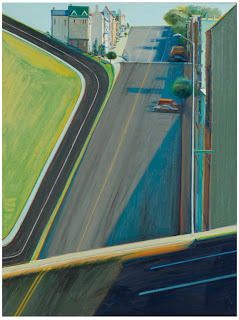 Currently Down Penn Street is being exhibited at Sotheby's and will be auction off on November 14, 2012.